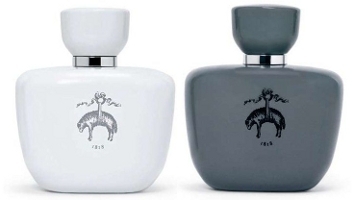 Brooks Brothers has launched Black Fleece fragrances for men and women, two new scents for Thom Browne's Black Fleece upscale capsule clothing collection. Browne describes Black Fleece by Brooks Brothers Eau de Toilette for Men as "...a timeless original scent evocative of that man sitting in a library or parlor smoking and drinking whiskey". It was developed by perfumer Vincent Schaller; the notes feature citrus, fresh spices, Bourbon geranium, rosewood, patchouli, incense and vetiver. Black Fleece by Brooks Brothers Eau de Parfum for Women is "an elegant and sophisticated scent for that independent-minded woman", and was developed by perfumer Steve DeMarcado, who found inspiration in a trip to Istanbul. The notes feature amber crystals, agarwood, gilded citron, Asian star jasmine, woods and incense. Zing! I’m looking forward to it. Get on it, Etat Libre d’Orange! They came close with Fat Electrician, I should think! I know this is a weird thing to focus on, but what are those things on the bottles? Is that a warthog? Pretty sure pinkfizzy below is right — a sheep. For Black Fleece. See, and I figured that, but it just does not look like a sheep to me. I was going back and forth between armadillo and warthog. Oh, dear. Maybe I just need new contacts. Or they need a new artist. An armadillo would be fun though! and why are they hanging there like that? That sheep is the Brooks Brothers’ logo. Still, the name Black Fleece is rather unfortunate. Who would want to smell like lanolin? I’m pretty sure it’s a sheep, but only because it’s called Black Fleece. It is definitely a sheep….my CEO wears Brooks Bros. suits and that logo is stamped on all the hangers etc. Yeah, their logo is the golden fleece – I’m guessing that’s why the fancy line is Black Fleece. Ha! And he brings the BB hangers into the office with his suits?Twisting an oft-uttered movie line to fit: “No [store] hangers, ever!” Even (gasp–especially!) designer ones. Stuffed (preferably scented) or solid, unmarked, wooden hangers only ;D .
The fragrances sound pleasant enough. I love the musty smell of old, fossilized clubs and libraries and that’s the vibe I’m picking-up from these releases. But the “Sacrificial Lamb” BB trademark and their “Stepford Wives” ad imagery have always creeped me-out, too, Miss Kitty . I’m teasing, of course. I’m all for saving resources. Many pointless old customs just crack-me-up and we are talking about BB, here ;). Yup, and that’s been BB’s logo for yonks. I love Brooks Brothers; it’s hopelessly WASP-y, but everything’s well-made and not outlandishly expensive — and in the original store in NY at least, they have old-school SAs who actually know something about what they’re selling. What a concept! All I will Say is… WINNERS! These Sound LUSCIOUS! They do sound pretty good! Wish they were doing smaller sizes (and prices). Nobody has a parlor…that’s what makes it aspirational, I guess! Everybody in Rhode Island with housing larger than a one-room apartment has a parlor (pronounced paahlah). The furniture is called a paahlah set. I love that most BB have a little stand with Royall Lyme (and Muske, Spice etc..) for under $30. I guess they are trying to go more upscale, but I’m quite fond of their basics (scent included). Yes, I think that’s nice too. There is something quaint about the idea of a simple “this is what a practical, yet respectable man should splash on after bathing and a shave” attitude. Moderately priced, “I’m a responsible member of society”: Brooks Brothers :). “Quaint” was a wicked word to use. I meant “pleasant”. Not BROOKS BROTHERS. No, no, nuh-uh. *the scandal, the horror* I’m humiliated on their behalf. People, this is desperation personified. Because of the packaging, or something else? I’m actually impressed with “Brooks Brothers” for mussing their dusty, stuffy image in releasing these. They sound sort of eccentric; quirky in composition. As we know, decadent scent is for those Jazz-Age-gin-splashing houses, with their french, wild, artistic sensiblity–like, like “Patou”! Or “Guerlain”! You know, scents for scandalous rebels, like that manx Wallis Simpson ;D! Yeah, I think the whole point of the Thom Browne collection is to update their image. I really like the solid, porcelain and/or enamel flacons, by the way. Looks like you’re not alone! But I don’t mind it at all. Can anyone recall the now discontinued fragrance called Golden Fleece that BB used to carry? Does this new one smell anything like it? Never heard of it, sorry!